We would like to introduce recent news and changes in the application. This article provides a single place where you can always find the most important updates with a detailed description of the functionality and the benefits it will bring to your business. Why: we understand that with 4.68 billion mobile phone users and with 205.4 billion app downloads in 2018 (projected to reach 258.2 billion in 2022 – statista.com) mobile is one of the fastest-growing channels to reach out to your customers. With such a fast adoption of mobile app usage, your company should be equipped with all the necessary tools enabling you to track and utilize customer mobile app data as a part of your mobile and omni-channel strategy. Up until now, Exponea provided the possibility to send push notifications (text only). – updated Mobile SDK – responsible for behavior tracking and enables you to execute use cases on mobile platforms (Android 5.0+, iOS 11+). Read more about Exponea Mobile App Marketing. Why: one of our top priorities is a seamless customer experience with the application. By merging Weblayers with Experiments, you will have the possibility to add weblayers using the convenience of the Experiments interface. Now you can make web changes, launch weblayers and A/B test the changes using the same Visual Editor. Please note that you can still use weblayers as a separate feature of Exponea. Create advanced prediction models with a few simple clicks with our new Prediction Templates. Why: Using predictions may not be the easiest task for a person without a data science background. At the same time, predictions are a very powerful tool, enabling you to target your marketing campaigns more precisely and only engage customers with a higher probability of completing certain actions (e.g. email open, purchase, etc.). For this reason, we decided to introduce the Prediction Templates which will enable anyone within your company to create and use advanced prediction models as a part of your marketing campaigns. How it works: Just open the prediction module in the application, pick one of the 5 templates, specify the time frame, and generate the desired prediction. Once ready, a new attribute holding the prediction value is assigned to each individual customer. This enables you to use the predictive data to target customers with an elevated conversion potential. The prediction value is recalculated every time you use it to ensure the most accurate prediction. For more advanced users, there is still the possibility to create a custom prediction. Custom prediction – predict if a customer from an eligible segment will match a custom target condition. Use a purchase prediction to assign a probability of purchase to each of your customers. Segment your customers with the highest probability of purchase, and target this segment with retargeting, email, or web optimization campaigns. Interested to know more about predictions? Read more in our recent blog. Why: With Adform retargeting you can use audiences defined in Exponea on Adform advertising platform. When you have dedicated support for your Adform DMP account you can easily create a retargeting scenario in Exponea. The Adform integration offers remarketing capabilities similar to Facebook & Google Ads. How it works: Exponea allows you to use 1st party data to optimize your retargeting campaigns. AI-powered predictions will help you build audiences with increased conversion potential, which will improve your retargeting performance and reduce the cost of advertising. Our omni-channel functionality enables you to explore new synergy with other marketing channels and deliver unified, personalized communication to every single customer. Compare the main metrics of impressions, clicks, average cost-per-click, spend, etc. between multiple ADs providers, without the need to access the information individually by logging into multiple accounts. Use advanced analytics and segmentation to define custom audiences. Use the power of AI and retarget your customers based on their predicted future behavior (e.g. probability to purchase). Combine retargeting with other channels and create unified omni-channel communication to improve conversion rates and reduce the spend on advertising. The data contained in ADs overview are downloaded in real-time from all ads managers, ensuring everything is always up-to-date. Example: omni-channel scenario using predictive segmentation. Why: It may be an overwhelming task to keep an eye on all your marketing campaigns. You may easily lose track of which campaigns are live, planned, or whether they yield the expected results. This may lead to ineffective targeting – wasting your time, money and resources. Campaign Calendar provides a single place to understand, design, and execute your marketing campaigns. Interactive visualization delivers an instant overview of the actual status, channel, reach, and owner of each individual campaign. To make it even more convenient, we added a possibility to easily evaluate and compare the most important performance indicators (engagement, conversion) directly in the calendar, removing the need to create a separate evaluation dashboard. With our Campaign Calendar, you will have a clear understanding of the effectiveness of your marketing efforts and discover any inconsistencies in campaign timing, design, or impact. Full-text search and filters based on channel, status, etc. Supported channels are Email, SMS, Push Web, Push Mobile. Soon we will be adding Webhooks. Currently, the Campaign Calendar is an on-demand beta feature. Would you like to be among the first companies to enjoy its benefits? Contact your CSM. Why: Scenario History enables you to view, compare or restore any of the preceding version of your actual scenario. This will help you discover any errors which may have happened during the design process and prevent situations like accidental deletion. Why: the new Customer Profile provides a one-stop location for your customer service teams to immediately understand each individual customer. The new Profile contains the most important e-commerce, personal, and event-related customer data. The layout is displayed across three separate screens, making it easy to navigate around different groups of data. The Overview page displays all personal and e-commerce information you need to know about a specific customer. Personal data – contact/basic info, key predictions, key segmentations. E-commerce metrics – items viewed (number), purchases (number), revenue, last order/campaign. 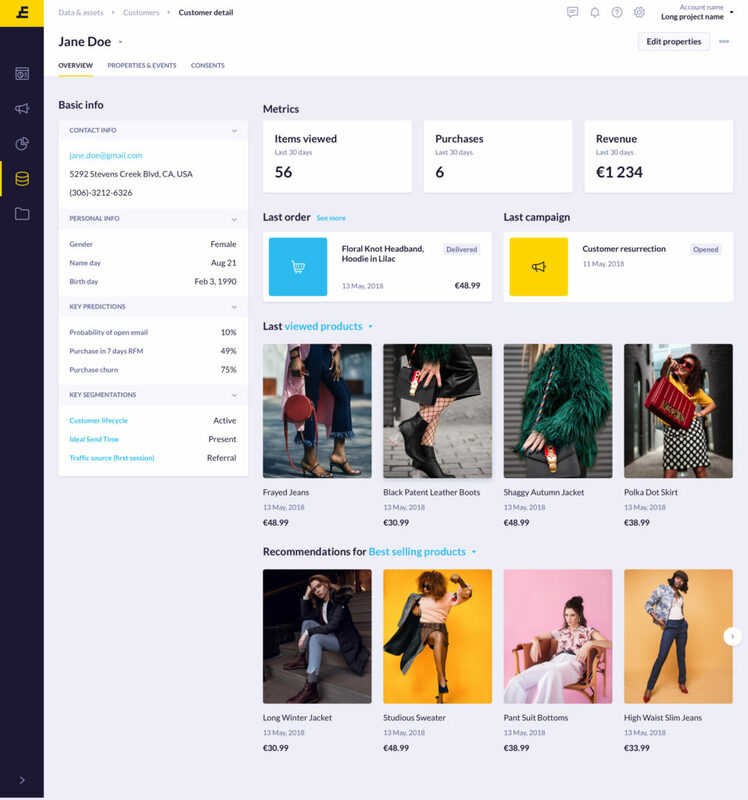 Visualisation of product data – the profile can display the last viewed, added to cart, and purchased products of a specific customer. Visualization of recommendation models – easily preview what products will be recommended to a specific customer, based on the selected recommendation model. This screen displays all data related to customer identifiers, properties (attributes) and events. Any customer property can be changed directly on the screen. 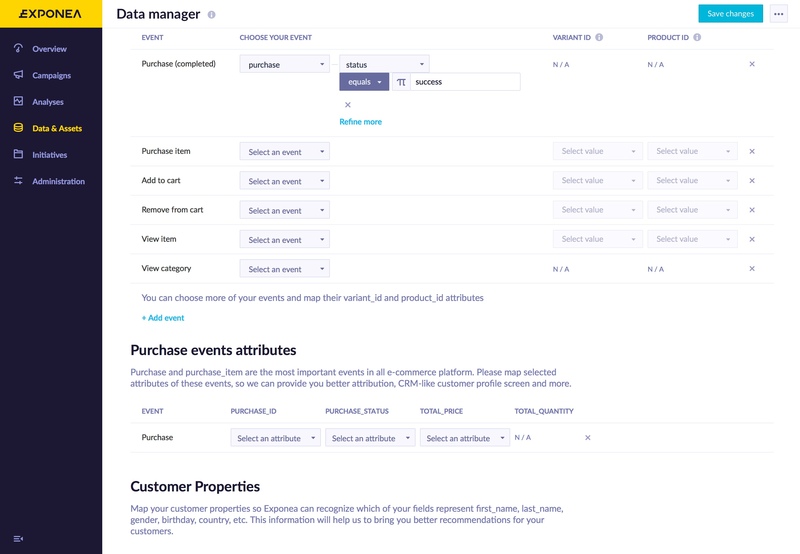 The update includes a new event filter that enables a search using multiple events, event attributes, values, and time. With the new Consent screen you can now easily revoke all consents with a single click. Note: the best possible experience with the new Customer Profile requires using our Data Mapping and the functionality of our new Catalogs. Why: we added two-step verification to provide an enhanced protection of all the data contained in Exponea. The second authentication step eliminates any vulnerabilities associated with single-step verification (password only), like phishing, theft, or accidental loss. If your password becomes compromised and two-step verification is enabled, your customer data in Exponea are still protected by the additional security layer. Currently, we support authentication via the Authenticator APP. It is a simple and very effective method of protecting your data. You just need to download the Authenticator App, generate the authentication code, and enter it directly into the Exponea App during the login process. We highly recommend two-step verification to all our users. To enable two-step verification, follow these steps. Why: this feature allows Exponea to understand clients’ data, simplify and enhance advanced features, and improve the overall experience with the application. Data Mapping helps Exponea understand your custom data structure without the need to change the current naming standards. This will enable the automation and simplification of advanced features. Why: this feature allows Exponea to understand catalog data, simplify and enhance advanced features, and improve the overall experience with the application. New catalogs will enable faster updates and inserts to your catalogs, and ensure better stability of the application. You can now also match pre-defined catalog labels (e.g. price, brand, size) with the naming conventions in your catalogs, which will help Exponea understand your product properties. As a result, product recommendations will be more accurate. The new catalogs now provide the possibility of picking up to 20 catalog columns, which will be searchable (indexed) and available in recommendations, and will allow you to use our upcoming features like Inventory Management.